Mothers and daughters ride a familial tide of joy, pride, regret, guilt, and love in these acclaimed stories of flawed, resilient women. Wheat bread and plain yogurt become weapons in a battle between a teenage daughter and her mother. An aimless college student, married to her much older professor, sneaks cigarettes while caring for their newborn son. On the eve of her husband’s fiftieth birthday, a pilfered fifth of rum, rogue teenagers, and an unexpected tattoo has a woman questioning her place in her children’s lives. And we follow through two decades the family created when capricious, magnetic Ruby, an ambitious college student, becomes a single mother to cautious daughter Nora in 1970s California. Shout Her Lovely Name is a “funny, bittersweet” (Vanity Fair) book that announces the arrival of a stunning new writer. NATALIE SERBER received an MFA from Warren Wilson College. Her work has appeared in The Bellingham Review and Gulf Coast, among others, and her awards include the Tobias Wolff Award. She teaches writing at various universities and lives with her family in Portland, Oregon. "Call it fiction, but this collection is achingly true to life when it comes to the many ways mothers and daughters grow together and apart, over and over again." "The characters are irresistible . . . Serber writes with exquisite patience and sensitivity, and is an expert in the many ways that love throws people together and splits them apart, often at the same time." "Mothers and daughters go at it in the way only mothers and daughters can, with full hearts and claws out, in Natalie Serber’s funny, bittersweet collection. . . . It’s the perfect firecracker of a book to 'accidentally' stick in the beach bag of the freewheeling mother who refuses to give up her independence and grow up, or to leave on the chaise lounge of the type-A daughter who’s forced to grow up and never gets to be a girl." "From its first page, Serber's debut collection plunges us into the humid heat and lightning of a perfect storm: that of American mothers and daughers struggling for power, love, meaning, and identity. . . .Serber's writing sparkles: practical, strong, brazenly modern, marbled with superb descriptions." "Serber is keen on the nuances of maternal bonds, and highlights them with an undeniable accuracy." -- More Magazine, "10 Short Books We Love"
"There is an element of the miraculous in a collection of stories whose characters reveal the fundamental predicament of all parents and children. . . .[Serber is] clearly writing not from some high plane of solitude but from within the mess of life." "Serber’s stellar first collection packs an emotional wallop right from the start...sharp, somber, and sparkling commentary... As provocative as it is poignant, Serber’s searingly honest depiction of the complex, contentious, and confusing bonds at the heart of all families heralds an exceptional new talent." "From the very first page, this extraordinary collection of short stories grabbed me by the throat and wouldn't let go. It is filled with poignant, thought-provoking observations on the delicate yet unbreakable bond between mothers and daughters. Serber has given readers a remarkable, heart-felt book to be savored, shared and passed on from one generation to another." "As its title implies, Natalie Serber’s collection Shout Her Lovely Name is a triumphant battle cry of hard-won victory over the stalemate and injuries between mothers and daughters. She leaves the reader amazed at the tenacity, tenderness, and truth of her characters." "Shout Her Lovely Name joins the ranks of the finest books ever to address relations between daughters and their mothers—equal parts love and sandpaper. I ached for these characters and cried at their hard-earned moments of joy. A book to make you marvel that someone really does understand, to make you grateful that she wrote it all down so fiercely, so tenderly." 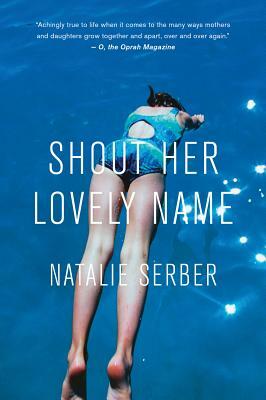 " In the complexities of family triumphs and catastrophes, Natalie Serber is always achingly specific. Between mothers and daughters, women and their lovers, she misses nothing, and in all her scenes, the reader feels the true breath of life." "In the tradition of Lorrie Moore and Tobias Wolff, Natalie Serber's stories uncover the secret hearts of seemingly ordinary people. Funny, heart-felt, and keenly perceptive, this is a book worth shouting about." "Coming of age is a painful and beautiful experience in Natalie Serber's hands. These are funny and poignant pieces, building a book that feels novelistic in sweep, yet true to the precision and direct aim of the short story. A real pleasure." The first story in Shout Her Lovely Name deals with a mother trying to make sense of a disease that is tearing her family apart.Why do you think our society, when looking at eating and body image issues, tends to point to the mother as the responsible party? Or do you feel this may not be true? Why do the mother and father react differently to their daughter's disease? The author chose to include several images in her story. What role do you think imagery plays in the telling of this story? What does the story say about the wider implications of eating disorders in American society? Why do you think the author began the collection with this particular story? In “Ruby Jewel,” Ruby seems to have undergone changes during her time away at college that are evident to her family and the people in her town. Describe an experience in which you’ve felt removed from the community you grew up in. Do you think Ruby’s father influenced the type of man she chose to pursue romantic relationships with later in life? Why do you think Ruby ignored her missed periods for so long? Do you think she was in denial or genuinely did not think that she was pregnant? Why do you think she engages in such reckless behavior after she finds out she’s pregnant? Why do you think Marco and Ruby decide to move to Manhattan, away from their families? One of the other new mothers in the hospital tells Ruby, “Una hija will never leave you. Girls stick together.” Do you think there is any truth to that statement? Are daughters more loyal to their mothers than sons? The narrator of “This Is So Not Me” is married to a much older man. Do you think that it’s possible to have an egalitarian relationship with a person who is significantly older than you? In the story “Manx,” Ruby goes on a date with Dr. Shapiro and doesn’t return until the following day, much to the chagrin of their next-door neighbor, who proceeds to lecture Ruby on responsibility. Do you think society looks down upon single mothers who choose to pursue romantic relationships while raising children? In “Take Your Daughter to Work,” why do you think Elena went to Ruby’s house when she was in trouble? Do you think Ruby is a better teacher than parent? If so, why? What do you think finally spurred Nora to see her father? Do you think Nora regrets reconnecting with her father? Do you think their relationship continued after their initial meeting? Do you think it’s possible for parents to have a relationship with their children after missing their childhood? Do you think it’s better for parents to stay together for the sake of a child even if they aren’t in love? In the story “Rate My Life,” Nora tries out some irresponsible behaviors. Do you think she is mirroring her mother’s raison d’être? How does skipping finals, taking LSD, and staying at Butterfly Beach with Aaron serve her? Or does it? Cassie seems to be experiencing some existential crisis in her life. What do you think set her on this path of ennui and discontent? Have you ever had to redefine yourself vis-à-vis the needs of your family, your work, and your relationships? Many of the relationships portrayed throughout the collection are strained, and yet there is an undercurrent of love and desire to care for one another, hence the epigraph from Joni Mitchell.Do you think the stories are a fair representation of family life? Some people think stories and novels about family and relationships are the territory of “women’s” fiction. Do you agree that literature is gender-specific?